Although Hackfall appears to be a natural wood, a "beautiful wilderness" to quote a nineteenth century writer, it is very much a landscape moulded by man. Hackfall is situated at the edge of of the village of Grewelthorpe, which lies three miles south of Masham and six miles north of Ripon in North Yorkshire. The landscape is a result of design and work undertaken by the Aislabie family. 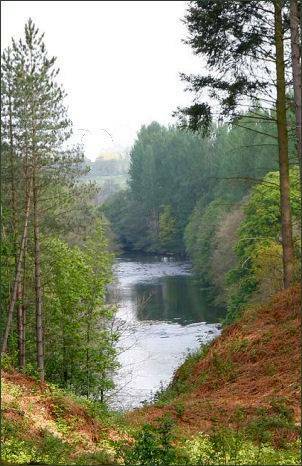 Between West Tanfield and the market town of Masham, the River Ure has carved out a winding route through high ground. The woods are set in a 350 deep feet gorge on the edge of Grewelthorpe. John Aislabie purchased Hackfall wood in 1731. Already famous for his landscaping work at nearby Fountains Abbey. In around 1750 his son William Aislabie constructed follies, many of which survive to the present day. William Aisabie also built grottoes, surprise views waterfalls and an impressive fountain, which can be seen from the terrace in front of the Banqueting House at Mowbray Point and from the Rustic Temple. The Banqueting House was used by the Aislabies to entertain their friends. The artist Joseph MW Turner visited Hackfall at the end of August 1816, whilst exploring the Lower Wensleydale area between Ripon and Middleham. Following a long period of neglect in the twentieth century, in the 1980s the Woodland Trust and the newly formed Hackfall Trust cleared out the dead wood, managed the trees and restored many of the footpaths..
Hackfall is now a Grade 1 listed garden. In 2007 a major restoration project funded by a £1 million grant from the Heritage Lottery Fund was implemented. This will be used to restore and preserve the buildings, dredge and restore water features, improve the foot paths and open up the vistas. A new car park has also been provided at the Masham end of Hackfall wood. 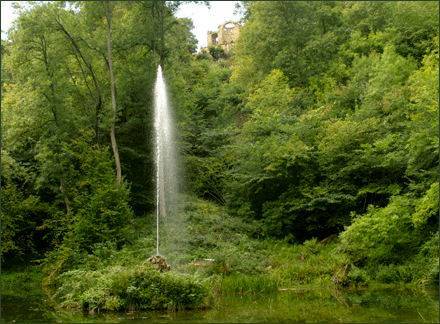 Hackfall is now a Grade I registered landscape garden and a Site of Special Scientific Interest (SSSI). Entrance to the unique landscape is free.